Malta is a small country made up of a group of seven islands located in the Mediterranean Sea. Malta is a charming country with great historical appeal and has very charming people. Lying north of Libya and south of Sicily, Malta offers holidaymakers a great variety of things to do while enjoying the brilliant sunshine. Malta’s climate is extremely hot during the summer months. The best time to go there on holidays is between April and June - September or October are also good months to visit there. The winter months remain mild with little rain. The cheapest time to visit Malta is between the months of November and February. The islands of Malta are very small but are heavily populated with plenty to do. 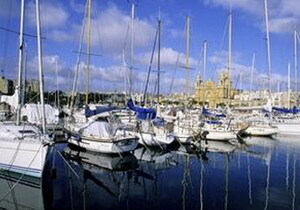 There are many great attractions and places to see on the islands of Malta. Malta is a great sun destination but it is also a great destination for anyone that is looking for a sightseeing break, anyone that has an interest in rocks or anyone that has an interest in history. Malta has a fascinating history that dates back well before Christ. Its location has made it a very popular spot for sea traders for thousands of years. Malta was the scene of one of the bloodiest conflicts known to man, when the Knights of St John defended the Island from the Muslim invaders. The Knights of St John ruled the island of Malta from 1530 until 1798. During this period the knights constructed many great churches and castles. Because of Maltas rich history there are many great architectural sites of importance especially around the capital Valetta. 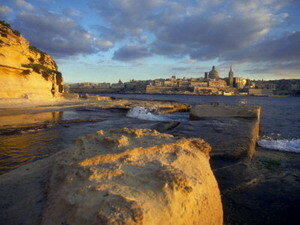 Valetta is a UNESCO World Heritage site with hundreds of Architectural monuments dating back for centuries. Malta also has a grasping rugged landscape with all types of rocks, caves, cliffs and beaches. The landscape of Malta is a haven for all sorts of wildlife. The coastline of Malta is very rocky with outstanding rock formations. Many beaches litter the Maltese coastline which attract thousands each year. The best time to visit Malta is during the months of April and June. During these months the weather is hot but extreme and accommodation rates are reasonable. During the months of July and August the temperatures are extremely hot and hotel rates are at their highest level. Restaurants on the Islands of Malta will cater for all of your needs. Traditional food include meat, fish, pasta and bread with rabbit stew being the national dish. Pastry is used with most types of food. Being an island nation all types of seafood are common. Another advantage of being an island nation is that Malta has excellent facilities for water sports and has also excellent spots for diving. There are many different types of drinks produced locally on the islands. The climate makes for good wine production and certain types of beer are also produced in Malta. 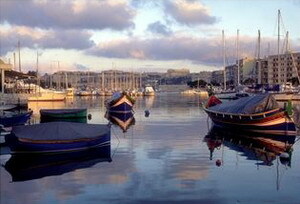 Malta has two official languages Maltese and English making it easy for tourists to communicate. Malta is a recent member of the European Union - people travelling between the European Union and Malta do not need a Visa. People living outside the European union should contact their local Maltese Embassy. 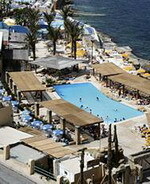 The Maltese are well used to catering for tourists so your holiday to Malta should be enjoyable and hassle free. About the Author: TJ Tierney is an award winning photographer and a freelance writer. 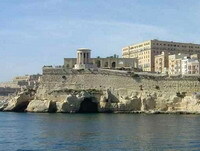 To find out more information on the Malta visit his travel guide or his travel directory. 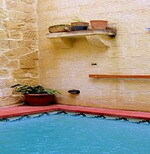 Rustically renovated to high standards farmhouse with private pool, situated in a small alley in the village of Xaghra. 2 bedroom property. This very old farmhouse is situated in a small alley in the village of Xaghra. The entrance to the farmhouse is sheltered by a large tree. The living area over looks the large split level pool area. Rustically renovated to high standards, this house is layed out on two stories. Both bedrooms are situated on the second floor, both with en-suite. A large sun terrace is located on the second floor with beautiful unobstructed country views. Sleeps 4, total bedrooms 3. Located adjacent to the award winning Kempinski Hotel San Lawrenz in the village of San Lawrenz, Gozo, Malta, the Kempinski Residences San Lawrenz opened in late 2008. This innovative concept offers an entirely new way of life, integrating a range of lifestyle opportunities and allows you to experience all the luxuries of a five star hotel, with all the privacy and comfort of your own home. Offering 60 luxury residences, which are available for sale and rent, either for a short stay (up to 30 nights), medium stay (up to 4 months) or as a home base for a longer period (over 4 months). 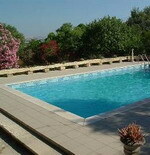 Luxury farmhouse villa having large garden, sun terrace and pool. Offering accommodation for 8 persons, this villa offers large entrance/reception hall, guests sitting room, fully equipped kitchen/breakfast room, formal dining room, living/tv room, three/four bedrooms (three of which have ensuite bathrooms), lovely outside terraces/barbeque area around the pool, and a very large garden. Extensive views of Malta are available from the roof, and the central location is ideal. Sleeps 8, total bedrooms 4. This very old farmhouse has been recently expertly converted and beautifully styled into a comfortable four bedroom vacation home, preserving all of its original rustic features. This beautiful farmhouse is located on the outskirts of Victoria in a peaceful road close to typical Gozitan countryside and is ideal for those country-walking lovers. It consists of four double bedrooms, all of them with bathrooms en-suite. One of the bedrooms is located on the ground floor with windows overlooking a sunny pool measuring 6m by 4m. The pool area also enjoys a sun terrace and barbecue and a lot of privacy. Sleeps 8. With its classic red shutters, stone slab ceilings, limestone flooring and a history that goes back to 300 years, Tal-Barun farmhouse will appeal to the most discerning of guests. This farmhouse is only a couple of minutes drive to the famous Dwejra Bay and it is only a short stroll away from the village square and local shops and restaurants and bars. On entering the house from the street where nothing is revealed of what lies beyond, it is only when you step inside that the farmhouse aspect is enjoyed. Tal-Barun farmhouse is set up on split levels and provides a stylish and comfortable setting for a self catered holiday. The entrance hall leads to a fully equipped kitchen with an antique table that comfortably seats 5 guests. Direct sunlight from the front windows ensure a warm welcome, while the thick stone walls keep the house cool even on the hottest day. Sleeps 6.